At "The Lure of the Prosperity Gospel in the Age of Trump," panelist Jonathan Walton (center) and E.J. Dionne (right) discussed the paradoxes of the evangelical tradition and how Trump has capitalized on its appeal to both rich and poor. The prosperity gospel, a strain of Christian belief that links faith, positive thinking, and material wealth, is finding a foothold in American politics with the rise of President Trump, according to panelists at an Institute of Politics’ John F. Kennedy Jr. Forum at the Harvard Kennedy School on Monday. Trump’s ability to tap into some of the themes of prosperity theology — in particular through his claim to be a self-made businessman — contributed to his political success, and in turn is helping elevate that strain of Christian thinking, the speakers said. Joining Quinn on the panel were E.J. Dionne Jr., a Washington Post opinion writer and William H. Bloomberg Visiting Professor at the Harvard Divinity School, and the Rev. Jonathan L. Walton, Professor of Christian Morals and Pusey Minister in the Memorial Church, and a professor of religion and society at the Divinity School. 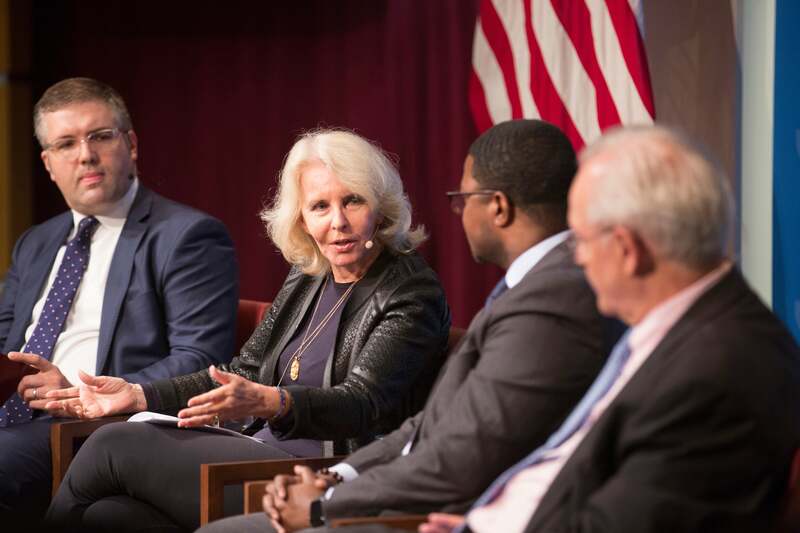 The forum was moderated by Nicco Mele, lecturer in public policy at the Kennedy School and director of its Shorenstein Center on Media, Politics and Public Policy. “Even dating back to the 18th century, you see some variant of this prosperity gospel in American Protestantism … a kind of unbridled sense of aspiration and accumulation,” Walton said. Quinn agreed that hard work and striving for prosperity are part of the American tradition, but she suggested that some prosperity theology leaders “have veered off into an unfortunate direction,” and voiced concern about their growing influence. When she began her own website, OnFaith, a decade ago, the prosperity gospel was disparaged by many people, including traditional evangelicals. But Trump, first on the campaign trail and now as president, has sought out as advisors people from the prosperity gospel movement, giving it new prominence. Walton, who has studied televangelists, said Trump takes their style to politics. “He knows how to put on a show. He knows how to work the cameras.” He said Trump’s appeal also reflects a trend that has seen many prosperity gospel preachers try to model themselves on successful businessmen, even referring to themselves as CEOs. Dionne said it was important to recognize that prosperity theology is not just a movement of poor people aspiring for wealth, but also appeals to those who are already affluent. “If you are successful, you must be blessed. And then at the other end of the class structure are folks who desperately need to be blessed,” he said. While he called the prosperity gospel “deeply flawed,” Dionne cautioned against “conflating too many forms of enthusiastic religion together,” noting that the evangelical tradition comes from a democratic spirit, and often a progressive one. Workers with strong social skills are increasingly valuable to employers, according to a new paper by Professor David Deming, while opportunities are shrinking for STEM specialists.